A friend of mine is celebrating her daughters 13th birthday next month. Since she lives out of state I decided to celebrate her birthday, in a box!! Ok, not literally! I put together some handmade party decor, which her daughter could use to celebrate with her close friends. I already have a blog post for most of the items I made in this box. I will put links at the end of the post so you can check out the tutorials for each item. I made a number 13 and a garland with washi tape. Below is a photo of the the decorated box. I first added a felt garland in pink and white. Next I made pinwheel cupcake toppers from patterned paper . You can use wrapping paper also. I then added matching plates, napkins and straws which I bought from Dollar Tree. I also made some decorative paperclips/bookmarks which her daughter could give as party favors to her friends. They are super easy to make and very useful. Gather some ribbons and paperclips . Cut two 6 inch pieces of ribbon, one slightly smaller than the other. Place them on top of each other. Pull both ends upwards. This creates a knot. you can put a dab of glue behind the knot to make it more secure. I made a few using a single thicker ribbon. 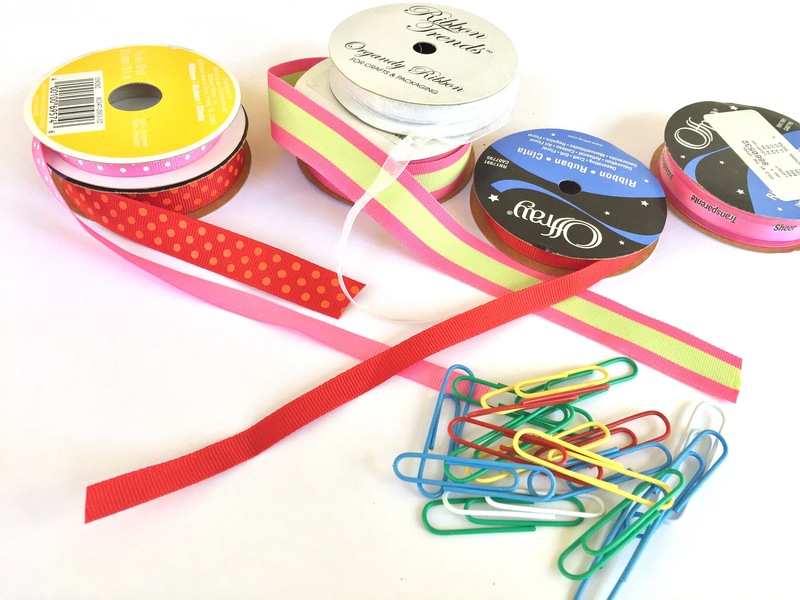 You can add as many ribbons as you like. Package each item in clear cellophane or ziplock bags. Place all items inside the box and it’s ready to ship. Now who wouldn’t love to receive a package like this !! With the inside of the box decorated this way, it actually does look like a Party in a Box! You don’t have to limit it for just birthdays. Send a care package to a loved one or your child away in college. Be a part of anyones celebration, no matter where you are.